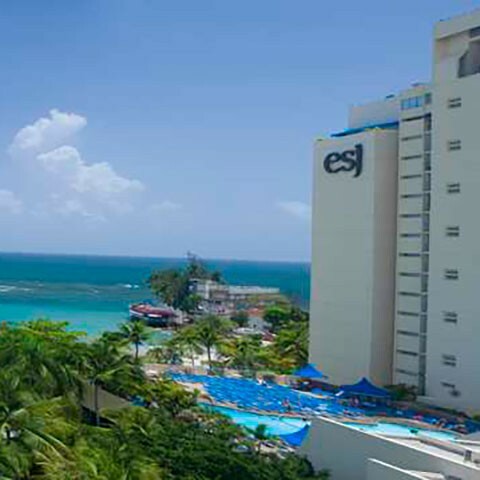 El San Juan Resort & Casino, A Hilton Hotel, is located directly on the beach in the Isla Verde district of San Juan, Puerto Rico. The hotel is a short walk from the shopping and additional nightlife of Isla Verde, five minutes from Luis Muñoz Marin International Airport (SJU) and fifteen minutes from the entertainment and historic attractions of Old San Juan. El San Juan Resort & Casino, A Hilton Hotel, is a lush 15-acre oasis located directly on the beach in the fashionable Isla Verde district of San Juan. Home to the Caribbean’s best nightlife and entertainment scene and Puerto Rico’s most beautiful stretch of beach, we offer every amenity necessary for an unforgettable vacation experience. The El San Juan Royal Casino is the epicenter of boundless entertainment and world-class gaming. A grand space and distinctive in style, there is something for everyone inside the 7,500 square foot, boutique casino.The gaming journey begins with your choice of 180 Slots, Blackjack, Craps, Roulette or Caribbean Poker. There is something for everyone… from the beginner to the seasoned gamer. Enjoy your favorite cocktail while you hone your table games skills and experience the Royal treatment. Located on the 10th floor of the hotel, Edouard de Paris feels like paradise, with a caring team of hosts and therapists. Pamper yourself with a custom- designed regimen of massages, facials and body treatment featuring Yonka-Paris the quintessence of phyto-aromatic skin care.Edouard de Paris, a signature Kérastase Salon located in La Galeria @ the Hotel Lobby, features masters at cut, style, make-up, stunning color, wax, and mani-pedi combos for Madame & Monsieur.